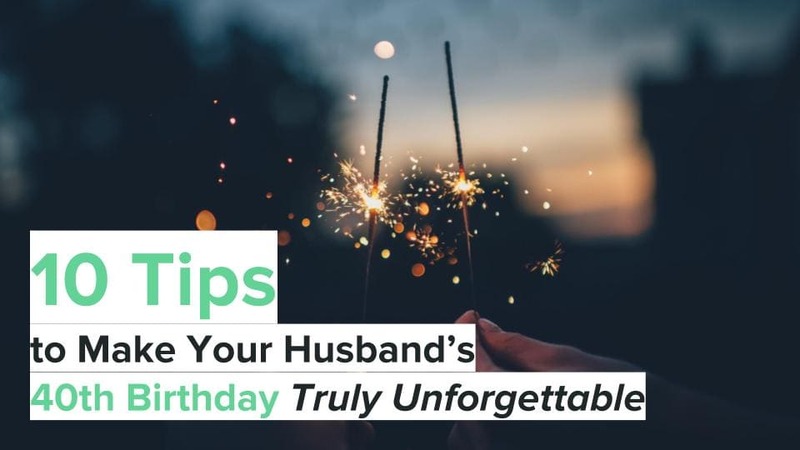 Your favorite couple is getting married or celebrating a momentous occasion together, and you want to help congratulate them by giving them a thoughtful and amazing gift that they will love! 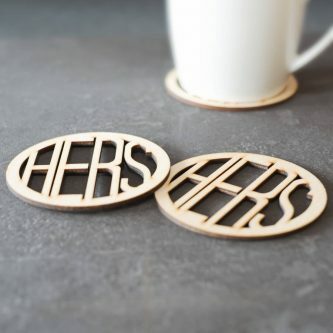 These are some of the best hers and hers gifts! Check some of them out to see what your favorite couple might really love for their wedding or anniversary gift! 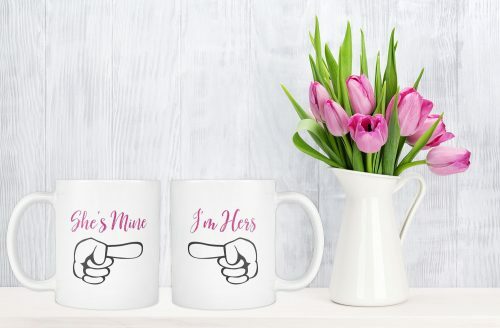 There’s nothing better than sitting at the kitchen table with matching coffee mugs to drink their coffee from and these are super cute, each claiming the other as theirs. 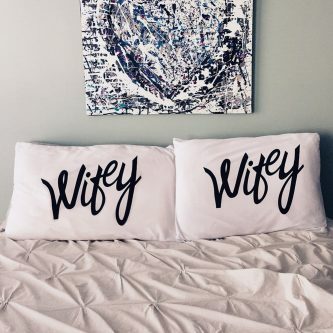 Help them decorate their bed with these double “Wifey” pillow cases! 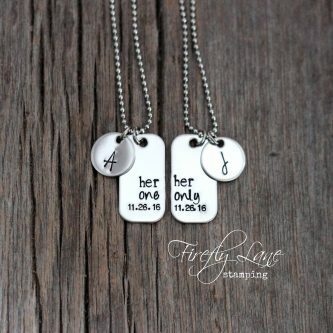 With these necklaces, they can put the date they got married or started dating, as well as their initial on each. Plus they show their unity by wearing the matching necklaces. 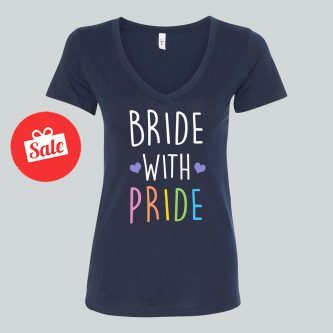 Help them show their pride while they plan their wedding with this tank top, just make sure to get two of them so they each have one to wear. 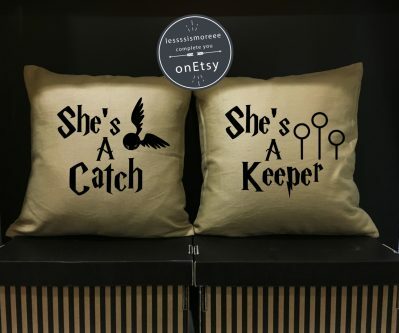 If one or both are a fan of Harry Potter, these “She’s a Catch” and “She’s a Keeper” throw pillow covers are awesome for displaying on their couch! These matching Mrs. and Mrs. wine glasses are absolutely perfect for them to drink wine together out on their porch, or to have a nice relaxing night together watching a movie. 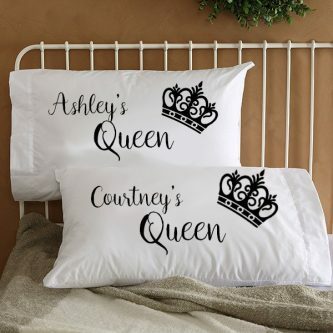 Personalize these queen pillow cases with your favorite couple’s names and they’ll love them forever. 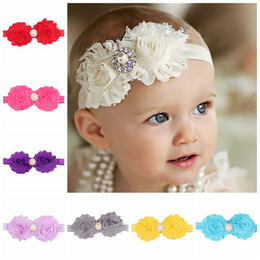 Sort of like combining matching rings or BFF bracelets, hers and hers bracelets are a symobilism of unity and teamwork. Help your favorite couple show their love for each other, and how much they are connected, with these key to heart couple necklaces. One of them cooks, the other one enjoys eating what they cooked. 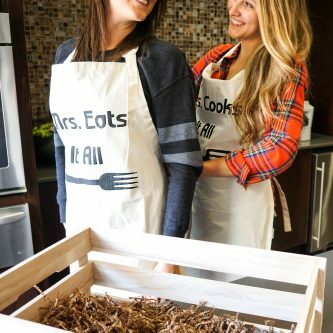 Perfect aprons for the perfect team! Connecting puzzle piece necklaces that put on display how their hearts are connected, and they make each other whole, are such a nice and thoughtful gift that they will cherish! A nice homey gift to adorn their living room with, one for each of them to set their drinks on and protect their tables in style. Stuff happens, sometimes they need a glass of wine to drown out the bad stuff together. That’s what having a partner means. They are not only lovers, but best friends forever. 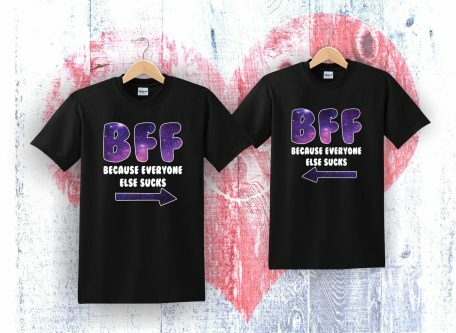 They need these matching shirts to wear! 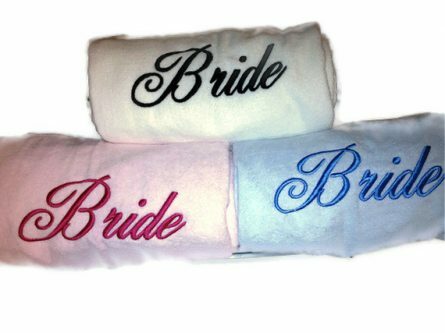 Monogrammed towels are a must when a couple get married, and these hers and hers towels come with a choice of colors! 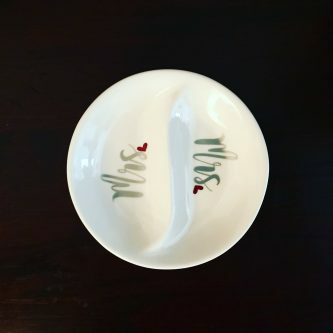 To put their wedding rings in when they’re not wearing them, this lovely Mrs. and Mrs. two-sided ring dish is a lovely choice. On each of these mugs is a cute cat wearing jewelry. 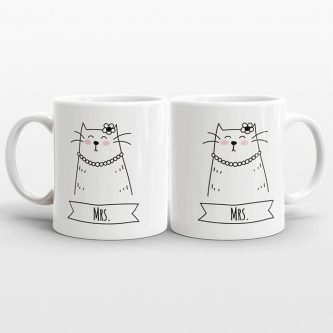 If your favorite couple are cat lovers, the mugs will be even better of a fit for them. 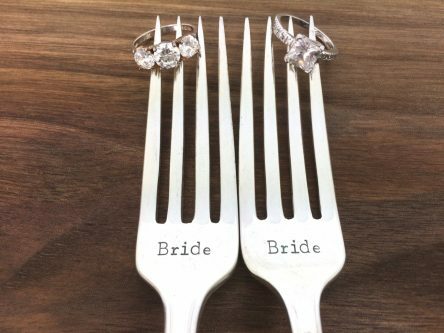 A great gift for their wedding, hand stamped matching bride and bride wedding forks. More for decoration than anything else but beautiful nonetheless. 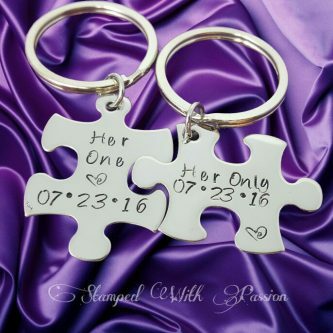 Her One, Her Only fitting puzzle piece keychains are the perfect place for them to put the ring to their shared house or car on. 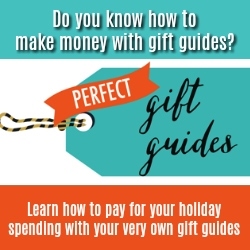 Show how happy you are for your friends with any one of these gifts. 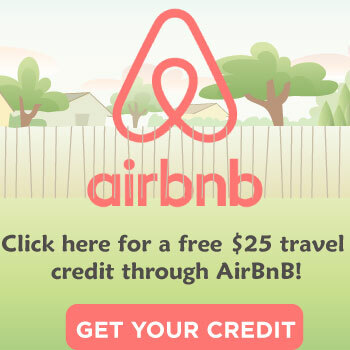 They are certain to please!